Why Did They Ban Teen Fiction--'My Enemy, My Brother'--in 1983? An eye-catching exhibit during Banned Book Week 2015 resurrects the history of a 1983 book-banning in Tucson, AZ. 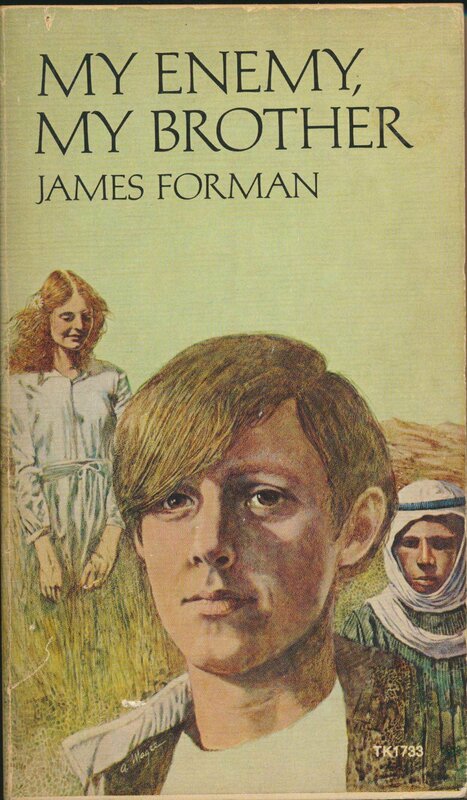 Below: The author's original copy of My Enemy, My Brother, banned in 1983 by Tucson, AZ's largest public school district, for the novel's alleged part in a "pro-Arab" conspiracy to control US oil companies through Middle East Studies centers around the country. Photo by the author. Still, no greater surprise on this topic, before or since, could have prepared me for what came next. Opening the book, I gasped when I saw the stamp on the inside cover marking the title as "Property of the Near Eastern Center"--the former name of the Middle East Studies institution at the University of Arizona and the target of "anti-Israel and pro-Arab" bias accusations. In other words, this copy wasn't just one of the titles the district prohibited from its classrooms 32 years ago this month. In my hands was actually one of the banned books from that dramatic, sordid affair. It should be at a museum or an exhibit, I instinctively felt, not discarded at a second-hand store. Today, coinciding with this year's national Banned Book Week, this artifact headlines an exhibit at the University of Arizona, spanning Sept. 28-Oct. 23, solemnly commemorating the local history as an example to fight future censorship. 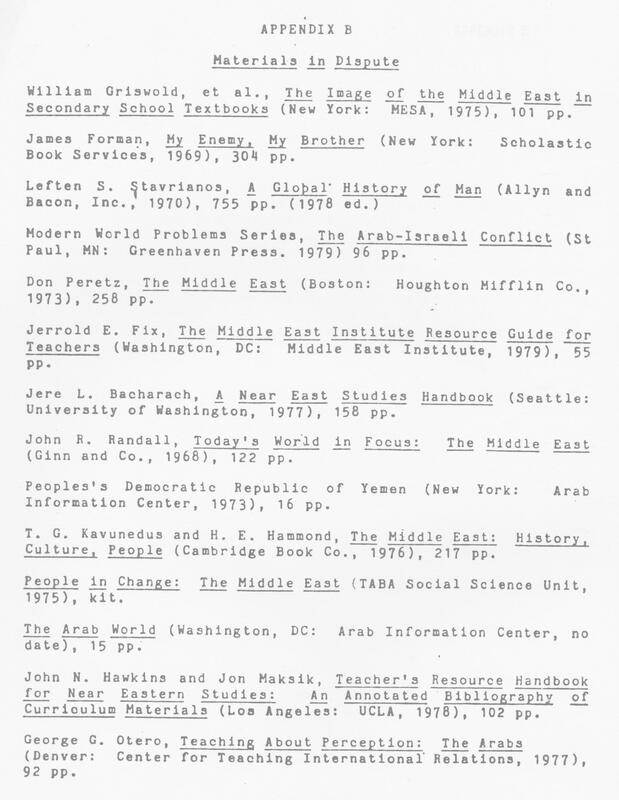 Below: The inside cover of the exhibition piece carries the "Near Eastern Center" mark, indicating TUSD's 1983 blacklisting of the teen book. Photo by the author. This little bound stack of printed pages which I leafed through that day, at one time, threatened to corrupt the young, according to TUSD? I ran my forefinger over its brittle spine and thought it might crack. The weathered pages felt like paper cardboard and the book wafted that stale smell of print volumes that perennially sit on shelves, hardly touched, year after year. I thought to myself, Who could ever want to ban this book (or any book)? Even though I knew the answer, I mused: how could they find this title, labeled "juvenile collection," so dangerous--and why? An all but forgotten local history unlocks these questions. Many people know that the Tucson Unified School District liquidated its acclaimed Mexican American Studies program in 2012 under threat of state financial sanctions. Fewer people, however, know of TUSD's history of banning Middle East Studies decades before. During Sept.-Oct. 1983, a nearly three-year campaign by the Jewish Federation of Southern Arizona to discredit the University of Arizona's Near Eastern Center, climaxed with the termination and book-banning of the center's outreach program in Tucson's largest public school district. Following a long spate of aggressive meetings and missives, the Federation succeeded, in collusion with district officials, to ban the program. Commenting on her report justifying the ban, then-district compliance officer Sylvia Campoy told the Arizona Daily Star, since the "Israeli government was apparently not contacted for materials" to draw up the Tucson curriculum, the Near Eastern Center promoted a "significant bias...of a decisively anti-Israel and pro-Arab character." The argument rested on the fact that the Near Eastern Center had received, according to a University audit (also included in the exhibit), "relatively small" donations from U.S. oil companies Mobil and Exxon. On this basis, Jewish Federation campaigners accused the center of operating under a pro-Arab conspiracy to control major aspects of U.S. public life and policy. "I call it the buying of America," TUSD board member Eva Bacal asserted at an Oct. 1983 TUSD public meeting. Other absurdist accusations included a citation in Campoy's report (reproduced from the original Federation complaint report) by a lawyer who claimed that the Tucson curriculum violated the State of Israel's alleged U.S. Constitutionally protected Free Speech rights. As a July 15, 1983 Tucson Citizen article noted, Campoy's "report also included a 'memorandum of law' prepared by Tucson attorney Paul B. Bartlett. The lawyer contended that the outreach center has violated the First Amendment to the Constitution...by trying 'to eliminate the Israeli point of view from the spectrum of views presented to public schools and the press regarding the Arab-Israeli conflict.'" Another claim said a map "eliminated" the presence of Israel, even though it was a map of the Ottoman Empire, which dissolved decades before Israel's creation. At the close of the affair, top-level University of Arizona officials, including former UA President Henry Koffler, railroaded the center's autonomy, despite two independent reports exonerating the program of "bias." Stifled, Director Ludwig Adamec resigned and the coordinator, Sheila Scoville, who was a personal target of the organizers' smear campaign, also resigned and left town in unjust disgrace. 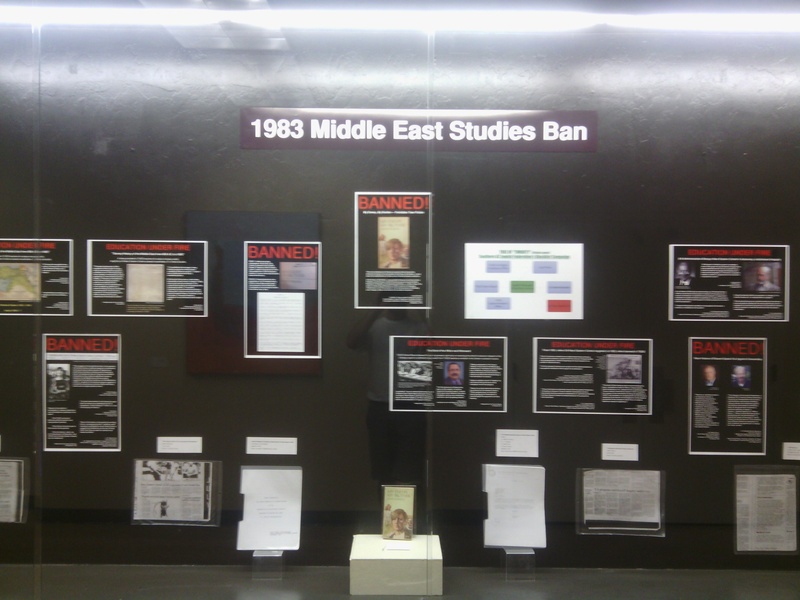 Below: A new exhibit currently on display at the University of Arizona featuring original artifacts and archival material of the 1983 ban. Photo by the author. "Not only textbooks but fictional accounts further blurred the distinction between fact and opinion," wrote Carol Karsch in a Congressional report submitted to the US House of Representatives. Karsch seemed annoyed that My Enemy, My Brother "was a favorite outreach selection" in the Tucson program. In his novel, Forman tells the story of the good-hearted Dan Baratz, a teenage survivor of Zambrów concentration camp. Dan and his grandfather Jacob are the family's last survivors who pennilessly trek throughout Poland to find the family's buried finances and end up at Jacob's home town in rural Poland. There, the first peers Dan meets are a motley group of Polish Jewish Zionists who dream of reaching Palestine to improve their lives marred by brutalization and wretched destitution. The youth speak wistfully about reaching their intended kibbutz (Jewish settlement), named "Promise of the Future," where they could be "planting vine twigs and lemon trees and fighting off Bedouins with an old pin-firing rifle when the need arose." Despite the coming-of-age story and overt conciliatory themes present in the book (if it isn't obvious in the title), Karsch was agitated by the depictions of Jewish characters in My Enemy, My Brother due to associations with Nazi imagery. It's a wonder whether Karsch or any of the Federation's pundits bothered to read the book at all. "He kept all his promises and perhaps he taught us a new idolatry: nationalism. I should hate after surviving here to go to Palestine and fall into the hands of Jewish Nazis. When you get there, Danny, be a Jew and be proud of it. Your ancestors have paid a price for the privilege. But we mustn't become closed off again in a spiritual ghetto. We must interchange with the world...We must be ourselves, not imitating those who persecuted us, not playing the persecuted man who's owed a living." Jacob ends his ominous warning by stating that Jewishness mustn't just mean matzo balls and herring, as it does to many people, but instead Jewishness should confer "dignity and charity and humor, and, most important, what we've seldom been granted: tolerance." As Jacob waves goodbye, he implores that his grandson remembers his advice: "Dan, be a good Jew. Never a Nazi, Dan." Pursuing "someone else's impossible dream" and his new love interest in one of the Zionists named Hanna, Dan sets off toward Palestine. Once there, confined within the barbed wire kibbutz and a war brewing as Zionist militias swallow more and more land while declaring Israel a state, Dan must decide whether to heed his grandfather's advice and stay true to his gentle nature or succumb to unjust power and corruption. These themes were too much for Jewish Federation and TUSD authorities who found the book so objectionable, it had to go. There's seldom any clearer example of censorship and of quelling academic freedom than banning a book just because one doesn't like the content. During Banned Book Week, the exhibition of materials and artifacts from 1983 Middle East Studies prohibition serves as a reminder of why there's no place for intolerance and censorship in a just society. 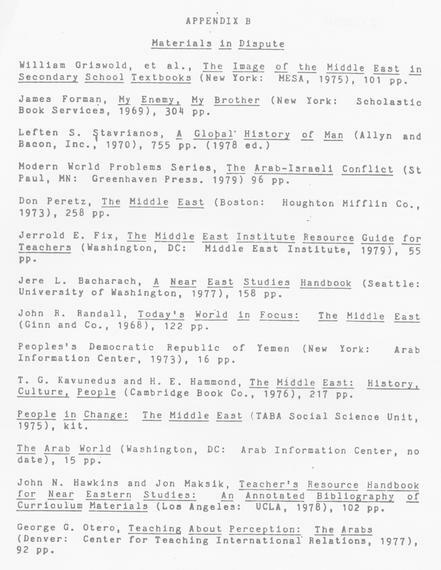 Below: Another exhibit piece, the 1983 banned book list of Tucson's Middle East Studies, taken from a blue ribbon panel report commissioned by the University of Arizona to investigate the matter. Photo by the author.